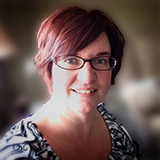 Thank you, Amy, for creating the challenge and all the administrative work you did to introduce participants to each other through the weekly recaps. I’ve virtually met some wonderful people who share the same passion I do. The challenge kept me writing through Dad’s illnesses and bleak prognosis and the death of my mother. I’m not sure I would have continued without the challenge and Dad’s voice in my brain saying quitters never win. Thank you for making it possible for people to easily share theircstorues with your 52 week challenge andca Hapy New Year to you. I may not have started writing without your challenge to do one blog post each week, a story, a biography, a photograph, an outline of a research problem, devoted to a specific ancestor. Thank you Amy. For my last post I shared the author’s seat with my cousin Jason Lombardi. He made it easy for me to say goodbye but I will continue to write about my genealogy finds. I had stepped out of research for a long time until I stumbked actosstossross your challenge in 2014, and excitedly jumped in. At first I felt overwhelmed as I had ever blogged or even had a blog, but quickly learned and had great help through Facebook blogging groups and met great people there. I didn’t participate so much in 2015, but continued to blog and recently printed all my stories of the 2014 Ancestor stories. Thank You Amy for writing that challenge! I look forward to continue reading your posts for motivation. Happy New Year! I want to add my thanks for your inspiration for blogging starting 2 years ago. You are directly responsible for the creation of my family blog at http://ssimms64.blogspot.ca and my husband’s family at http://ssimms642.blogspot.ca and also the creation of 2 books using http://www.blurb.com from these blog posts. The ripple effect with the joy and appreciation of family members continues to grow and I want you to know that it all started with you. One truly never knows where her influence will end. Cheers, and Happy New Year Amy! This is such a bittersweet ending. First, thank you so much for launching this project and then doing all the admin work that goes along with it – especially in the midst of your own family crisis. I knew I needed to do something like this, but really didn’t know how to get started. Doing a “book” is daunting, but I figured I could do one ancestor a week. This week, as I finished number 104, I realized that one a week is daunting too, but the motivation of and commitment to the joint “project” kept me inspired and going through all of the “life things” that were constantly interfering. Thank you for the push and nudges. I know this time has been very difficult for you too – prayers continue for you and your family. I will be continuing to write about one ancestor every week. It’s the only way I’ll ever get “done,” whatever that is:) I will very much miss your weekly recaps though and seeing what everyone else has been writing about. In honor of the end of the second year, I wrote about one of my toughest ancestors to research. I wanted to get this one off of my plate so I didn’t have to dread it any longer:) Ironically, I think it’s my longest article. Amy, thank you so much for letting me participate in the challenge this year – “Pinterest-style!” I never mentioned that one of the reasons that I didn’t think I could keep up with having a blog at this point in my life was that my own mother is in the midst of a cancer fight (stage 4 kidney). But SOMEDAY, I may start one. You and all the lovely bloggers here have been such an inspiration to me. I have enjoyed all the wonderful stories that have been posted! On to “Week 52” – My main “genealogical resolution” this year is to delve deeper into the Civil War. My son has been doing a self-study of the Reconstruction Era and its effects on the South and all of its peoples, and that has put the desire in me to once again, visit the Civil War era. I listed three focuses for that; 1.) Missouri, Missouri/Kansas Border, 2.) Texas in the Civil War, and 3.) ancestors and other family members who fought in the above areas, as well as other places. Overall, I want to study the effects of this war on my ancestors who were living at this time, all aspects of their daily lives, etc. of both soldiers and civilians. Let me add my sincere thanks for your encouragement and determination, Amy! Life happens whether we’re writing or researching, anyway. Might as well write and research in our passions. This week for the last hurrah, I wrote about my Irish Breakthrough (capital letters, indeed! ), in my ex-husband’s family line from Bath, Ontario. Help from an unknown-to-me genealogy researcher led me to an amazing resource in County Cork, Ireland. Let me add my voice of best wishes and thanks, Amy, for your inspiration in setting so many of us on our writing paths. I recently put my 52 posts for this year into book format for my children and grandchildren as a Christmas gift. It would never have occurred without you and the “52 Ancestors” project. This week’s story includes my resolution to try to find the Germanic origins of my Hoover family who show up in Pennsylvania as part of the “Pennsylvania Dutch” community. Will I continue to write and blog in 2016? Definitely! It’s too much fun to stop. Amy, I agree it is time to end off on the 52 week challenge. It has been fun and rewarding! I started a blog just to do it and plan to continue writing on it. Thank you for the idea and the guidance! For Resolution I did my 4th Great Grandfather, Daniel Noyes Cookson because very little is known about him and I plan to change that! Many thanks Amy for inspiring me with the challenge. I have modified it for my one-place study but it has inspired me to look at a wider range of folk than I would have done otherwise. The summary of my challenge is on http://tinyurl.com/hff89v6 and my final resident is on http://tinyurl.com/htu8ho8. Bit of a cheat this last one. I am sorry to hear about your mother, hope all goes well with her treatment. Take care. Due to a number of technological difficulties I was never able to rise to the Challenge–either in 2014 or 2015. But I was determined to make it work in 2016 and was so disappointed to learn that Amy–quite understandably–was not going to continue. I thought I’d see if there was a way to resurrect the challenge in some form and found your comment! I am so excited that you are doing the challenge in 2016, too! I am going to follow your blog. Please feel free to follow mine, too, if you want. I will visit your site right now! I want to figure out how we can do this, too! Yay! So there are three of us anyway.What a wonderful account of your grandmother’s life, Cathy. So sad that her history was kept from your mother. Fantastic! I will check your blog out, too! Just wanted to let you both know that I posted my first entry of 2016. I was inspired by a scene in the movie Brooklyn and has to do with the emigration experience of a number of my ancestors. I’ve been enjoying your posts, Mary. I just now noticed that you also have your blog name here, Cathy, so I’ll be checking it out too! Mine is areyoumygreatgrandmother.blogspot.com. I’m glad we’re doing this! Thanks for this challenge. I watched others do this in 2014 and I decided that I would try in 2015, mostly to have at least one blog post every week and also to be sure I have written a blog post about all of my direct ancestors to my third great-grandparents. I have been blogging for a few years, so I have written about many of them already. Due to my success in keeping up with this challenge, I have added a landing page to my blog that lists all my third great grandparents and includes to blog posts about them. See http://frommainetokentucky.blogspot.com/p/third-great-grandparents.html. One of my goals for 2016 is to explore my DNA matches. Having a page that lists these ancestors (and their parents, if I know them), will make it easier to share possible common relatives by directing DNA matches to my blog. Thank you Amy, you’ve been an inspiration! I joined the 52 Ancestors Challenge late in 2014 but still managed to write about 68 ancestors, with many more started. I’m not ready to stop yet so will continue into 2016. I may slow the pace down a bit but the challenge does keep me motivated. For my last post of 2015, I wrote about a special ornament I made for my late mother-in-law. Thank you for everything, Amy. You inspired me to begin writing in my blog regularly, and I now post something every day. My last 52 Ancestors post is about my 5th-great-grandfather Andrew Russell. I need to get his land records. Amy, we solute you! You have helped us all write about our families, and our research journeys, using a fun format yet challenging timeline that pressed us forward while providing peer support and encouragement from fellow “challengees”. As someone else has said, I wasn’t up to writing a book, but writing one story at a time made me believe that I was the little engine that could. I too will keep blogging and writing stories about my ancestors, but probably not weekly. Thanks to you for making this year memorable and productive. For the first time this year I broke tradition and wrote about a living person and a brand new story: my husband Terry BOORMAN and how I surprised him this past Christmas with a photo memory book about himself and his family spanning 4 generations, past and present. He loved it, as so did the family. My second post for an ancestor in my 52 ancestors challenge is my grandfather, Ralph Yetter. I chose to write about him today, because today would have been his 120th birthday! Amy-I have really loved doing the Challenge and am sad to have it end! 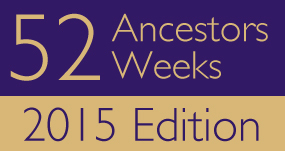 Do you know of any other genealogical challenges out there for 2016? 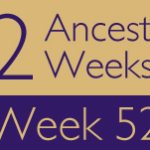 Although I did not blog, I took the spirit of the 52 Ancestors Challenge and focused one week of intense research per ancestor. It was a great discipline for me and will continue it through 2016. Most of my results ended up on profiles at Wikitree but maybe I will link them, perhaps, to a blogging stage. One reason I have not been blogging is Writers Live platform has not been working on my computer and I just found out that Microsoft will not support it anymore. Hope your Mother has a better year with her health. I am still on the hunt for more information on this week’s ancestor (I’ve hit a big brick wall).